"...was thining of gng to the teakland" this message from Vibin got me on the roll. I had been planning to visit Nilambur eversince I saw the first photographs of this line on IRFCA. Although I had been to this place by road a few times (just passed through on my way to Bangalore), I never had the opportunity to try the railway service. 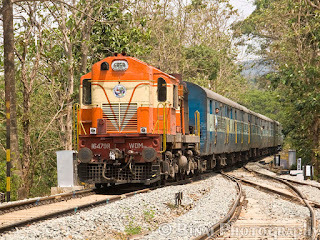 The Nilambur Road-Shoranur railway line connects Shoranur in Palakkad district to Nilambur in Malappuram district. Nilambur is renowned for its teak plantations, and this was the very reason for constructing this 66km long railway line. The line was completed and opened in phases in 1927. The line was later closed in 1941 during the World War. Due to public protests, this line was relaid. The Shoranur-Angadipuram section was reopened in 1953, and the remaining section in 1954. 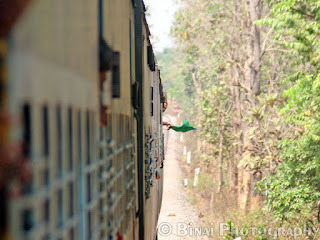 The line passes through a scenic section - paddy fields, teak forests, looming hills, rivers, etc. The line was badly neglected by authorities until recently, when the Nilambur-Mysore Railway Action Council took up the cause and got more trains to the section. Some time in the late 1990s, the railways had ordered the closure of this line due to poor revenues. However, the section now has a totally different tale to say. This section sees 6 pairs of passenger trains and one pair of express train daily - up from a paltry two pairs about decade back. The daily collection from this section has also gone up over 10 times. The section has grades in places, and the mps in this section does not exceed 75kmph anywhere. The last stretch from Thuvvur to Nilambur has the lowest maximum speed. Sometime in 2008, I had made exhaustive plans to visit this line - but rain washed down all my plans, and the journey was put off. The same repeated in 2009. The number of trains in this section kept increasing from time to time, and planning a journey became easier. The message from Vibin was the last needed encouragement. Finally, I drew plans to join Vibin at Shoranur. I messaged Jayasankar, who replied positive. So finally, it was the three of us traveling by this line. Our trip was planned for February 10, 2012. A day prior to the journey came another stumbling block - a harthal in Thrissur district! I was determined to make it this time, and I quickly redrew my plans - I decided to take the Ernad Express to Shoranur, instead of the Shoranur passenger as planned earlier. Since the Hartal begins at 0600hrs, I left home around 0545 hours - crawled my way to Ernakulam. The train was only at 0815, and it takes just an hour from my home to Ernakulam by car. After a royal crawl, I made it to Ernakulam by 0720hrs.Headed straight to the ticket counter, and took a 2S Unreserved M/E ticket to Shoranur. Next on the agenda was to have my breakfast. Had a leisurely breakfast, and got on to the platform sharp by 0800hrs. The train (16606 Nagercoil Mangalore Ernad Express) came in by around 0815 with Golden Rock WDM2 #16878 doing the honours. I got into CC and upgraded my ticket - there were lots of takers for AC Chair Car in this train, and the TTE had hell of a time writing Excess Fare Tickets! The train left Ernakulam around 0830hrs. I had an aisle seat - the coach (10150) was built in December 2010 by ICF, Chennai. The seats were awful - cushioning was really poor, and the contour in the headrest was painfully hard. The train has a non-stop run from Ernakulam to Thrissur, and hence it ambled along at most stations at full speed. I had a power nap, and later spent time reading newspaper. 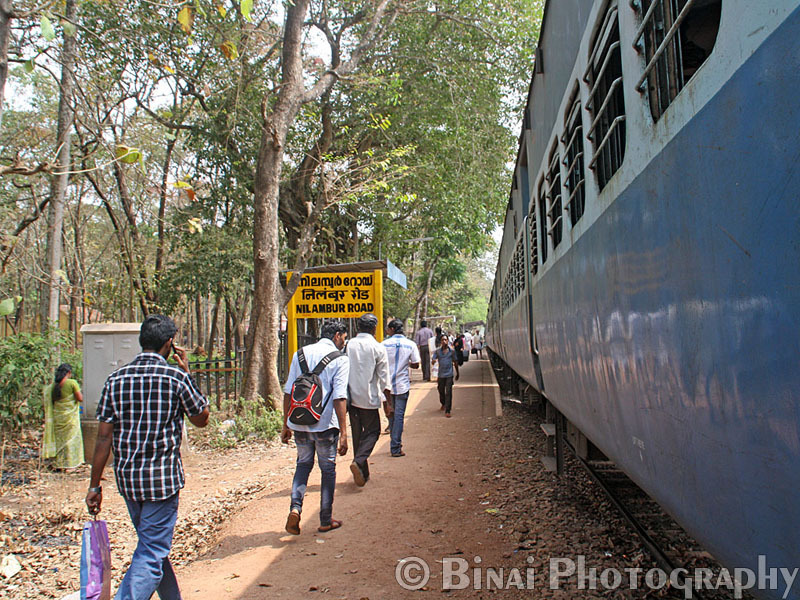 The run slowed down from Chalakudy onwards - the Ernakulam-Shoranur passenger was just running ahead, and we had to stop at every station for the passenger train to clear the section. We made it to Thrissur by 0940 - the station was heavily crowded, thanks to the hartal. 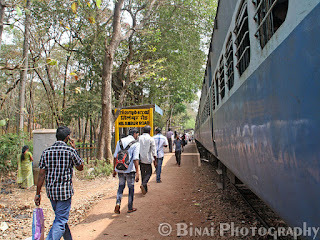 The run from Thrissur to Shoranur was decent - we overtook the passenger at Mulagunnathukavu. Made a brief halt at Shoranur home, for the Ernakulam bound Mangala express to cross over. We made it to Shoranur by 1030hrs. Vibin had already reached there - he purchased tickets for the two of us, and was waiting on the platform by then. We headed straight to the refreshment room on Platform 2/3 to get our lunch parceled - while I got food from the Veg Refreshment Room, Jay & Vibin got their food from the Non-Veg Refreshment room. The VRR at Shoranur serves some good food - the food this time was not exceptional, though. While we got our food, the Ernakulam-Shoranur passenger rolled in to Platform 3 with WDM3A #14046 of Ernakulam doing the honours. I was expecting this rake to head to Nilambur - but that wasn't the case. While we were contemplating which coach to sit in, they announced that the Nilambur passenger would depart from Platform 1. The rake which just came in from Ernakulam was taken to the coaching depot for maintenance. In the meantime, the Coimbatore-Mangalore Fast Passenger pulled out (a WDM3D of Erode was the power). 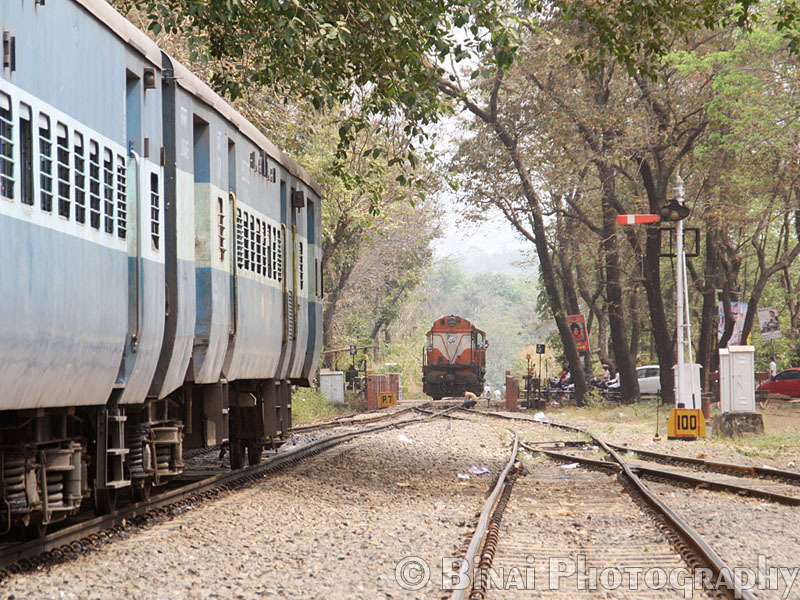 We headed to Platform 1 to find our rake already there - there was a loco at the Palakkad end. We did not check the loco, but directly headed to a coach which appeared close to empty - we got window seats and we settled down. I wanted to see the loco being brought in, but it was already coupled by the time me and Jay headed towards it. It was WDM3A #14046 of Ernakulam (the same loco that brought in the passenger from Ernakulam. Flag exchange while leaving from a station en-route..
Our train: 56616 Shoranur Jn - Nilambur Road Passenger, had about 12 coaches (including the two mandatory SLRs). We were in the fourth coach from the loco. We started off perfectly on time from there - the train takes a "dedicated" line right from Shoranur station. The line runs parallel to the Kozhikode line for some distance and then branches off towards Nilambur. The Nilambur line is surrounded by Teak plantations right from the point it veers off from the main-line. We reached our first station in no time - Vadanamkurushshi. This station has been remodeled recently - it does not retain the charm of a way-side halt station anymore. Its all concrete platforms now. Stations came and went at quick pace. Our coach had more than one flat wheel, and it made hell lot of noise. At one station, Vallappuzha or Kulukallur, Vibin spotted a small countryside teastall - and he kept reiterating his wish to have tea there! The stations were all halt stations - the train just stops and goes. We pulled into Angadippuram (AAM) at around 1239 (perfectly on time). We had a crossing here - and the crossing train (56616) was yet to reach there. We were taken on Platform 2 (loop line) at AAM - the station is being remodeled, and the platform was very narrow. I and Jay rushed to the loco to catch the crossing - we walked a bit ahead, towards the starter on the main line. Our pairing train came in with WDM3A #16479R of Ernakulam doing the honours. As soon as the pairing train came in, both us rushed back to our coach. Both the trains were cleared simultaneously. Angadipuram has two platforms and also has a siding for FCI. Reportedly, the station has another loop line earlier, which is now being remodeled. 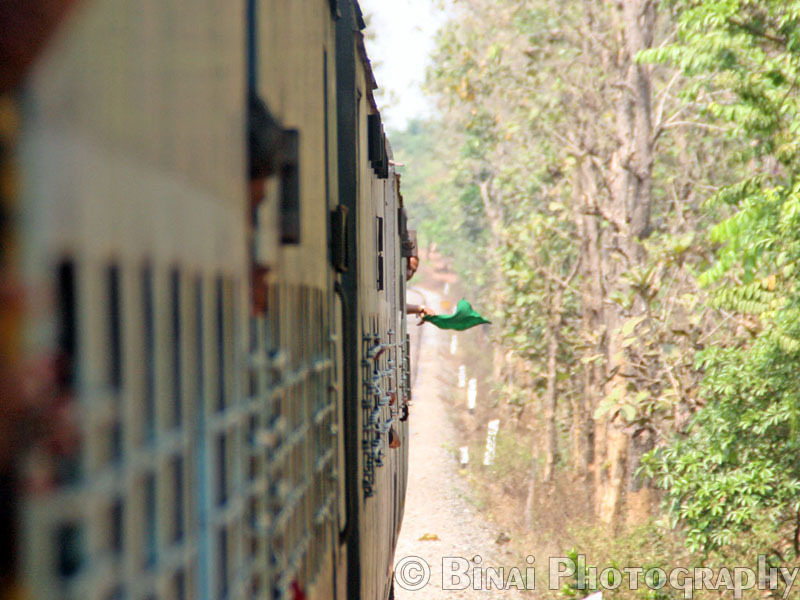 The train slows down after AAM (not much) - the section was all dry, but with teak trees all around. It was very dusty, and standing at the door was more or less impossible. Almost all the stations in this route were being "modernised" - they just lost their branch line charms. The run beyond was eventless - the three of us were engrossed in discussions about various aspects of railways in Kerala, while the train rumbled through the arid countryside. Our loco being shunted, to take charge of the return run. "Our coach had more than one flat wheel, and it made hell lot of noise." Can you please explain what you mean by this? Watch movie Ennennum Kannettante, the last part of it is in this station. Dust was because of this time of the year, any time after the rains, you should revisit this line, you will fall in love for sure.